The names of the NGOs Award of Excellence 2017 winners have been finally announced. 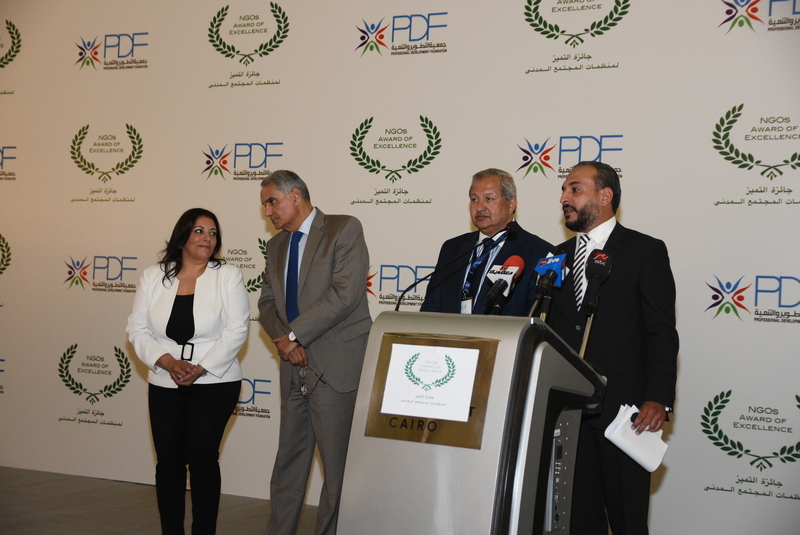 The Professional Development Foundation (PDF) celebrated the NGOs Award of Excellence Ceremony at the Marriot Hotel in Zamalek, with the attendance of Mr. Mohamed farouk Hafeez - PDF Chairman, Mr. Tamer Badrawi - PDF Vice chairman & Secretary General. 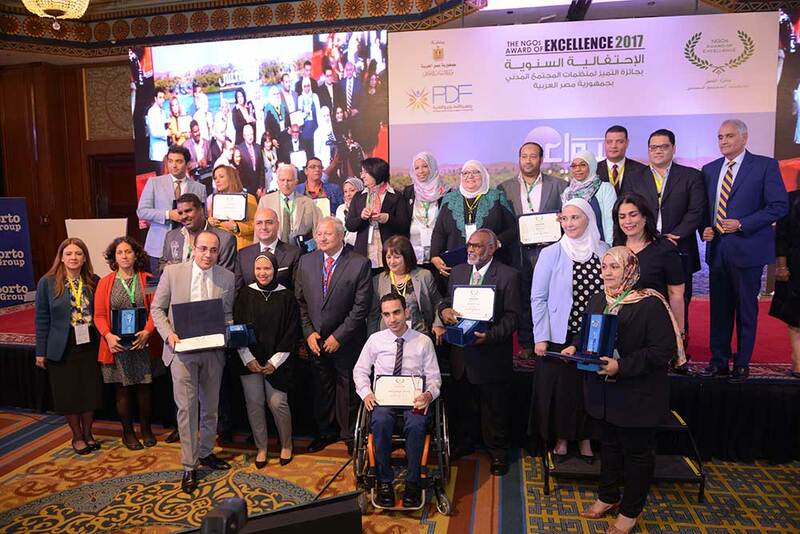 In an atmosphere filled with festivity, passion and positivity, the attendees cheered to Alhassan Foundation for Differently Abled Inclusion landing fourth place, Akoon Foundation for Comprehensive Development coming in third place, Children of Female Prisoners Association coming in second place, and Community Development Association in Aswan securing first place in the competition. During the ceremony, appreciation was also announced to the runner-up candidates receiving in-kind prizes. In addition to the judges committee, Dr. Laila Iskandar, the former Minister of Urban Development, Dr. Ikbal El Samalouti, Chairman of the Board of Directors at The Hawaa Future Society, Ms. Amal Mwafi, an ILO Representative, Dr. Essam Al-Adawi, Minister advisor for Social Solidarity of International Organizations, and Ayman Abd El Mawgood ,Head of the NGO Sector at the Ministry of Social Solidarity, Dr. Mohamed Nady, Chairman of the Board of Directors at Absher Communications Company, Dr. Hala Youssef ,former Minister of Population, and Dr. Ibrahim Hijazi, Member of Parliament, were all honored during the ceremony in appreciation of their roles and efforts in society. PDF launched the 2nd round of the NGOs Award of Excellence during a press conference on the 30th of April, 2017. The NGOs Award of Excellence is a PDF initiative under the auspices of the Ministry of Social Solidarity, aiming at developing and supporting the civil society sector with an emphasis on providing the right measures to upgrade their professional and administrative capabilities as well as motivating innovation, and NGOs promotion of core competencies before the private sector entities thus supporting the substantial projects in the areas of development to contribute in social problems solving. 200 NGOs submitted their online applications for the NGOs Award of Excellence through PDF’s website during the registration phase that ended on June 1st, 2017 and lasted for one month. Upon receiving the applications, CSSC Team conducted 10 Orientation Sessions on the duration of 3 days, and were attended by 85 representatives from 80 NGOs from different Egyptian governorates. The registered NGOs are currently submitting the required documents to be reviewed by the Internal Committee which will start its mission on July 16th, 2017.